JFBC is sending another team to Clarkston, GA, this time for five days. We will be helping with the Clarkston Rocks summer music camp. Since the team will commute back and forth from Clarkston every day, we would really appreciate prayers for safe and easy commutes, as well as for health and energy. 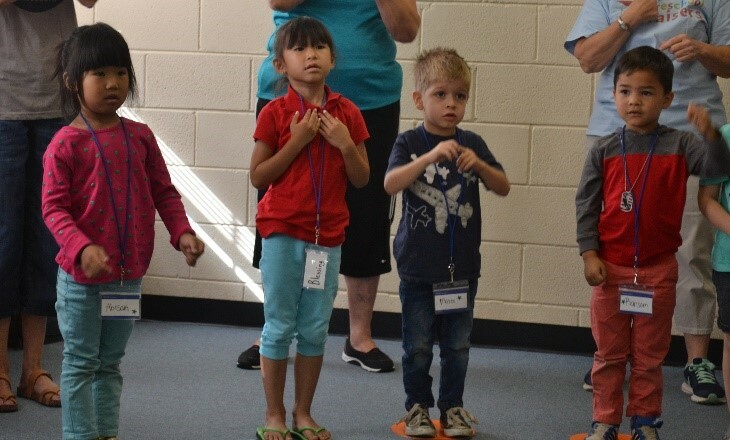 We are so excited to share our passion for the Lord with these children as we teach them about music—not simply for its own sake, but as an expression of worship. Music can be such a powerful tool to share about the Lord and to lead people into relationship with Him. Please join us in prayer as we show love to these children and their parents and as we serve as the instruments of the Lord in His mission to seek and save the lost. We thank you for your prayers and support, and we cannot wait to share with you what all the Lord has in store over the upcoming week and beyond! A “Beats and Brushes” class is just that! BEATS: getting to play all kinds of cool instruments; using your body to clap, stomp, and pat out neat new rhythms; and learning new songs! 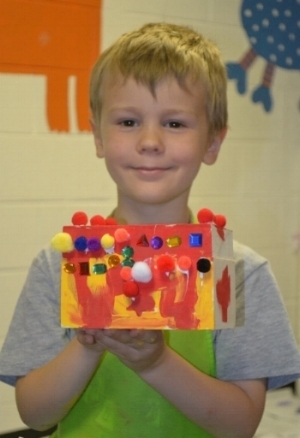 . . . . And BRUSHES: making cool crafts with paint, glue, and who knows what else (macaroni, perhaps?)! We made “prayer boxes” to save all the prayers that our young people will want to lift to God and to then observe His answers! We made backpacks with lions all over; a lion puppet; a lion sun catcher; and a lion’s mask for our final performance. We had to admit that having a wonderful story about God’s protection involving lions leads to some really fun crafts! We’ve had an eventful and productive time so far. At just halfway through the trip, more has been accomplished than expected, and God has tremendously blessed us with new friends at Operation Mobilization (OM) – the organization we’re assisting. Before the trip, we asked the Lord for good weather so we could get as much work done as possible. The weather has been clear and warm all week, which is extremely unusual for Ireland! The Irish countryside is spectacular, and Lacken House is an incredible place. It’s exciting that God placed it in the hands of OM to be used for the Kingdom. 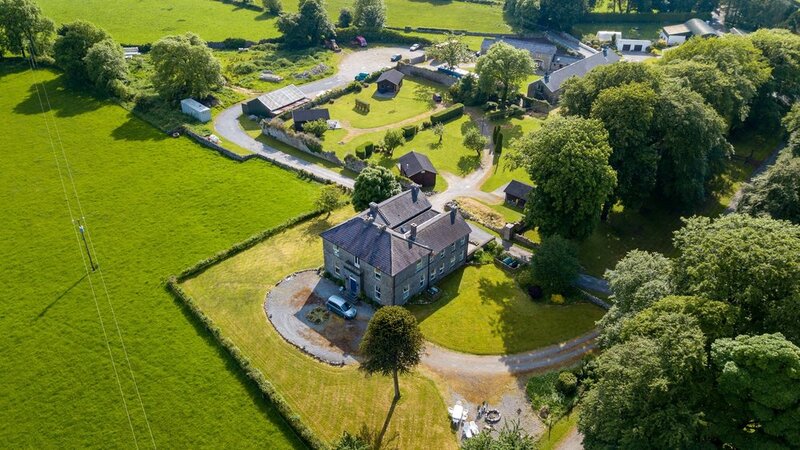 An aerial view of Lacken House and the surrounding grounds and chalets. 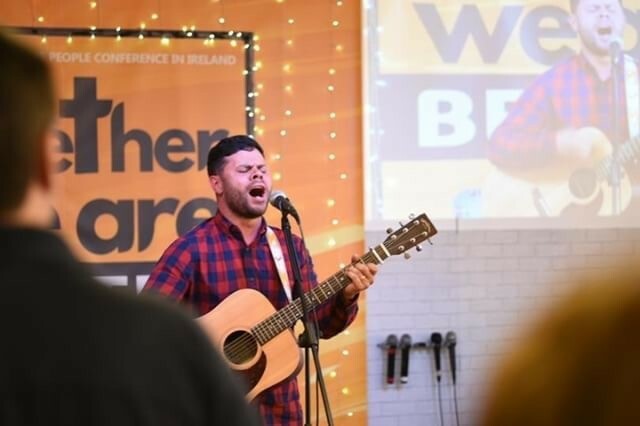 On Sunday, we attended church at Life for the People Church, a Portuguese congregation dedicated to outreach in Ireland. They were welcoming, friendly, and fun to interact with. We ate lunch with Daniel and Ashlyn Lowe. Afterward, we watched the Soap Box Derby. The track had a ramp and curves, and the entire town came to see. 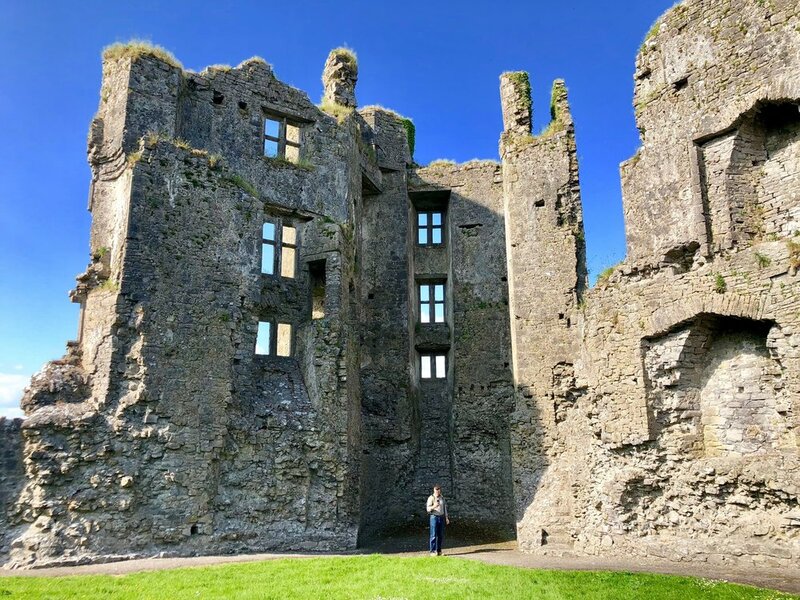 We finished the day at the ruins of Castle Roscommon – a fascinating site! Monday and Tuesday, we set to renovating the chalets here at Lacken House. Here’s Kay removing caulk from one of the chalets. Since the sanding machines couldn’t remove paint from the grooves in between the planks, Jim had the “character building” job of hand sanding these areas. 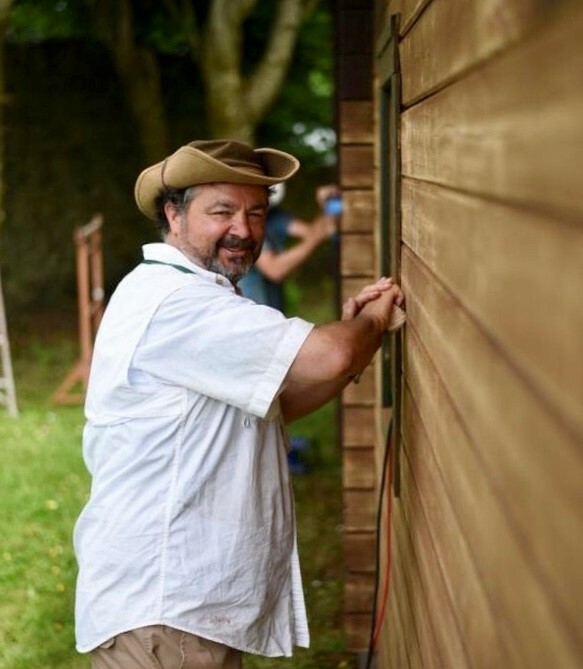 After the sanding was complete, the team began putting two coats of paint on the chalets. God has blessed our progress, and despite one or two hurdles, we’re ahead of schedule! It’ll be exciting to see what’s accomplished by the end of the week. How is it that our team from Johnson Ferry will be participating in an “international” mission by driving 21 miles to the southeast to Clarkston, instead of to Hartsfield-Jackson Airport? Here are some fun facts on Clarkston, Georgia! TIME Magazine once called it “the most diverse square mile in the United States.” It would seem that that is very true, since according to the Clarkston website, there are 60 different languages spoken within the 1.4 square mile that makes up Clarkston! We will be working with Proskuneo Ministries, a ministry in Clarkston with a vision for “bringing all nations together in worship” so that we might “worship on earth as in heaven” as the Apostle John describes in Revelation 7:9. 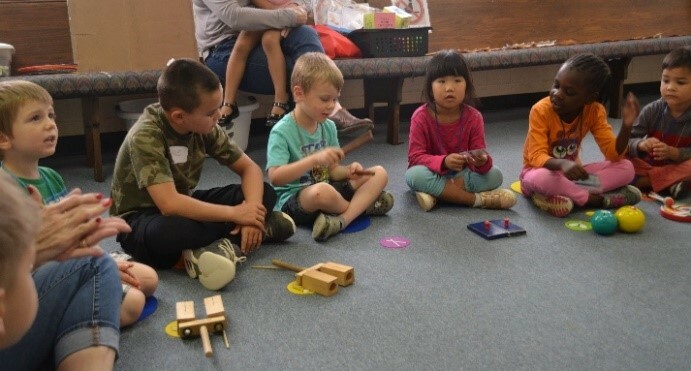 Proskuneo Ministries offers various music and art classes to students of all ages in Clarkston. In the last couple of years, our teams have been a part of their expanding the ministry by offering various music and art camps in the summer. As part of that vision, our team of 9 ladies will be leading a “Beats and Brushes” music camp for a group of 4-6 year old’s from a wide variety of nationalities. Our theme is “Daniel in the Lion’s Den.” So, we are equipped with some fun songs on prayer, obedience, and LIONS! The van will also be loaded up with cool crafts and yummy snacks! So…..now what we would covet is your prayer support! Please pray for safe travel to and from Clarkston each day and the health of the team. Please pray for divine appointments as team members have opportunities to share with the music camp participants, parents and staff. Please pray that the spiritual songs, Bible story (Daniel in the Lion’s Den) & scriptures we are teaching will penetrate the children’s hearts. On the last day of the camp, we will invite the parents to a short program to listen to the songs their children learned and see their handwork with the crafts. Please pray that the parents and care givers will come to the performance and will understand and know the One True God about whom we are sharing. Here we are moments away from beginning our 5,000 mile journey to work with Romanian pastors to work with their congregations to build up a prayer ministry as their power source. Putting on a US style BBQ and having church members invite their unchurched friends is one of the ministry opportunities for the team. Here we are selecting the meat at a local butcher shop. Our first session of the prayer retreat for 30 pastors and prayer warriors from the surrounding area. What a blessing to see the Holy Spirit burst out in another language! Closing prayer to conclude the first day of the prayer retreat. Our trip leader, Earl, is enjoying the outpouring of prayer from our brothers and sisters who speak Romanian. I suspect he’s listening with joyful anticipation with Revelation 7:9 in mind. Searching God’s word for what it says about prayer. It’s Saturday so it must be BBQ time! 30 men came, ate, and shared life experiences: your blogger just slipped up and didn’t photograph the full gathering. Sunday worship, with 4 baptized! This is how one dresses for baptism in Romania. Full immersion too! No changing clothes. Each person gives their testimony with their family beside them. Roaming around the Roman ruins excavated in Alba Iulia. A garrison of the VIII Legion was established here to protect the nearby salt and gold mines worked by the Romans. Evening worship with shared testimonies. Great to have the youth help out with worship! Making up 10 packages to be delivered. Victory is 91 years old, came to Christ when Communists in power in late 1970’s, persecuted for her beliefs, and the first in her village to be evangelized. Anna has Parkinson’s but is overjoyed that a church from the US built her a house that is not open to the elements or rats. Her old house appears below. Our concluding activity was a women’s outreach event where testimonies were shared. Tomorrow the team begins the trip home, inspired and humbled by what God is doing in Romania. This was our final day and one we will always remember with our fellow Christians. There is no better way to begin one’s day than with praising God through song! Our friends know how to do that! 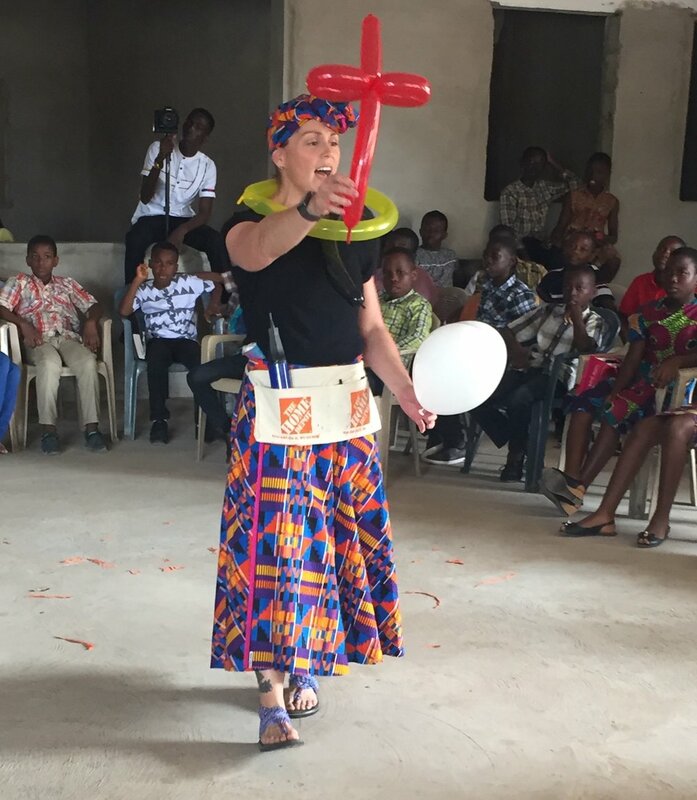 Ministering to the children was so joyful. We were blessed by their enthusiasm, respectfulness, and receptiveness to the message. Three hundred children came to church, and we were thrilled when eight accepted Christ today. To God be the glory for that! We will miss our new friends in West Africa but will always remember their gracious hospitality. We pray that the ideas that we shared with them will be useful in their children’s ministry. We believe that many teachers now realize that young children can learn the word of God. Please pray for our safe travel home and that our efforts will be multiplied for the Kingdom!! Father God , we just want to thank you for the men and women who have planned for us, prepared our food, made sure we had water, and much much more. Please multiply back all the time they spent caring for us and their time away from their families. Multiply that back to them Lord. Father, we thank you for the Sunday School teachers and pastors who have such a heart for impacting the children so that they would know that God loves them and has a plan for their lives,.